My first attempt for painting the hilt was to use a base coat of yellow, then dry brush various shades of gold metallic paint. But that didn't work at all. Metallic paint doesn't give good coverage, so it ended up a splotchy mess. 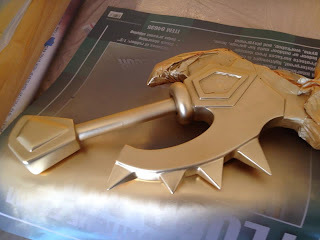 I redid the base coat with gold spray paint. It looks pretty good and hopefully I'll be able to add shadows and highlights using acrylic paint over it. It took me a while to come up with a plan on how to create the talons for Varian Wrynn's bracers. Really, the talons are what kept me from building the bracers before now. What I ended up doing was cutting a piece of pink insulation foam and sanding that into the general shape. 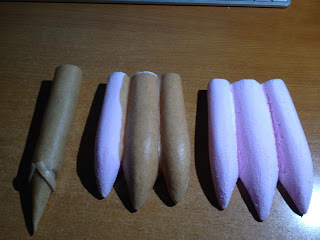 The talons on the bracers are built from shaped insulation foam, then covered with Worbla.